Slurp a Bowl of Fish & Veggies Soup! 2 Comments on Slurp a Bowl of Fish & Veggies Soup! A hot bowl of soup sure makes one feel a tad better. Imagine the warm essence of broth trickling down into your tummy like a comforting hug. It sure is a soothing treat even when one is unwell. 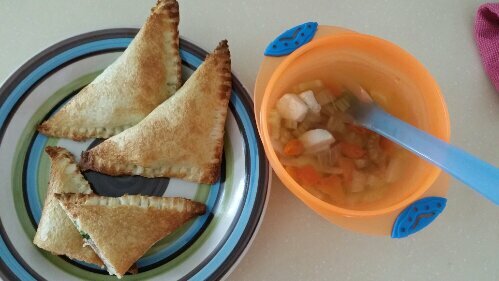 We did this simple soup to go with baby V’s Fish Pot Pie Turnover (many mums told us it was a hit with their little ones too!) so she had some soupy mix to her meal. 1) Bring a pot of water to boil and blanch fish, without having it fully cooked. 2) Add tomatoes, onions and celery into new pot of boiling water to make soup base. Cook over low heat for 30min. 3) Add fish into soup and allow to cook for about 15min to allow fish to fully cook and fish flavour to immerse in soup. Taste soup to check on flavour. Add salt or seasonings if preferred, but we served sans either. 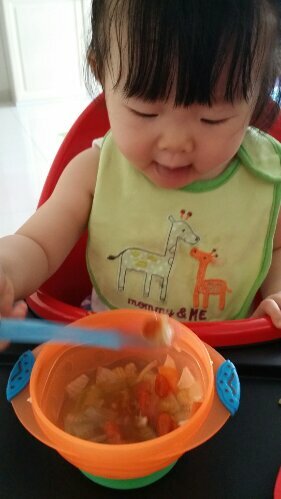 Pour into bowl and allow to cool slightly before offering baby! Fish Pot Pie Turnover with Fish Soup – double yums! And the little one was busy slurping away! It WILL get messy when they are learning to use utensils – expect soup dripping everywhere, ingredients falling onto the floor and a messy moustache. All in good fun and part of their learning experience! – Soups are common in Asian diets and don’t belittle soups! They contribute to the fluids intake for both adults and children. 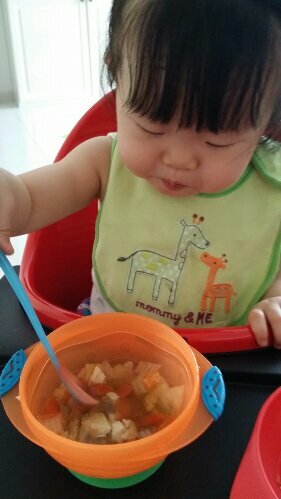 If your bub is rejecting water, soups make a great alternative and it’s nutritious to boot! – Soups are really versatile too. Mix it up with different types of fish (batang, threadfin, salmon, cod, sea bass, garoupa and more! ), meat, veggies and even tofu, egg, beans, mushrooms so your tot gets varying nourishment from these fresh ingredients. – The usual soup base is ikan bilis, but having too much of something may not be good. Ikan bilis contains high levels of sodium too. 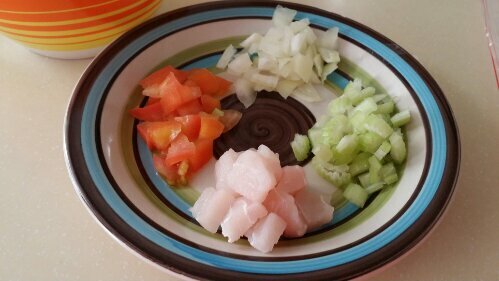 Using tomatoes and onions help add natural sweetness to the broth, and brings out the freshness of the fish or meat used. Wolfberries are also known to lend a dose of natural sweetness in soups and steamed dishes too. – Onions are favoured for their natural antibacterial benefits, and are great in fighting colds and bugs especially when one is unwell. We did a pretty (self-declared!) 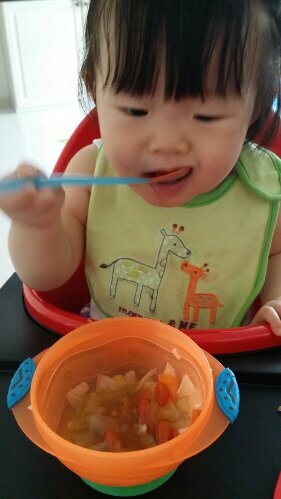 immune booster for baby V when she was unwell, and included onions and garlic in the dish too – she finished everything for someone with a wavering appetite during that period! You may like to try it too! – Soup stock can be made and freezed in advance too, so busy parents need only cook it once (during the weekend) and the frozen stock can be used on weekdays when bubba is with another caregiver or simply, thaw to use – time saver tip! Hope you enjoy cooking this simple, homely soup! Have a slurping good time too, boys and girls! Stay connected with us by subscribing to our mailing list, follow our adventures on Facebook and Instagram too! Next Entry Egg-free Tofu Pork Patties – and They Don’t Crumble!